The NT2-A Compact Studio Kit by B&H combines the intial gear you will need to record your vocals, guitars, and more. 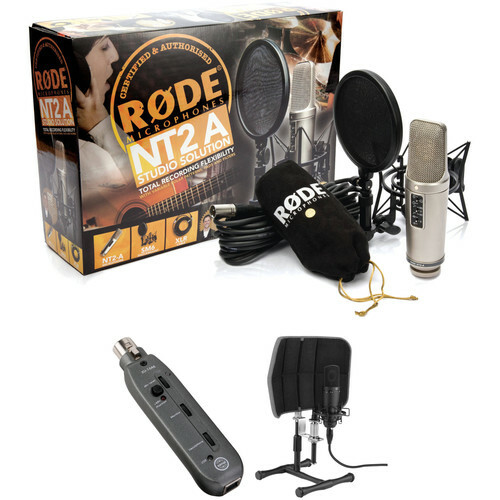 It includes the NT2-A multipattern condenser microphone, the SM6 shockmount and pop filter, a 10' XLR cable, and a dust cover. It also includes the Senal compact XLR-to-USB adapter interface that allows you to plug your microphone into the USB port of any Mac or Windows computer for use with your favorite digital recording software and the RF-C12 Professional Desktop Isolation Filter from Auray. The XU-1648 from Senal is a compact XLR-to-USB adapter interface that allows you to plug your microphone into the USB port of any Mac or Windows computer for use with your favorite digital recording software. Its rugged build and plug-and-play operation make it perfect for bands, recording artists, podcasters and more. For use with dynamic or condenser microphones, the XU-1648 delivers 16-bit/48-kHz studio-quality sound. It also features a microphone preamp with gain control and switchable 48V phantom power. Its 1/8" headphone output features a volume control and allows for zero-latency monitoring. There is also a monitor level control to adjust the balance between the audio playback from your computer and the sound of your microphone. In addition, the XU-1648 features a tough, all-metal chassis with non-slip neoprene feet on the bottom to prevent it from slipping. The gray RF-C12 Professional Desktop Isolation Filter from Auray is a desktop solution that allows music producers, broadcasters, and podcasters to get better recordings by isolating a microphone from vibrations and sound reflections, especially when its used in a space that is less than ideal for capturing audio. The Auray Desktop Isolation Filter makes capturing clean, dry vocals or instruments more natural sounding with less sonic coloration. The RF-C12 fits on a desk or tabletop and uses multi-layer acoustic treatment to absorb unwanted ambient noise and control acoustic reflections. So, if you're recording vocals, voiceovers, or podcasts in an untreated room with hard surfaces, the RF-CF20 provides advanced microphone isolation. Recording, broadcasting, or podcasting in rooms with little-to-no acoustic treatment can wash-out vocal or instrument audio recordings with echo reflections. The Auray Desktop Isolation Filter fits on your desk or tabletop and minimizes reflections of unwanted noise bouncing off hard surfaces from entering your microphone. Usually, expensive acoustic foam is required on walls for your room to sound dry. With this reflection filter, you capture what you want in your own room or workspace. Multiple layers of acoustic treatment help to isolate your vocal and instrument recordings. A thick layer of composite fiber surrounds your microphone and absorbs unwanted reflections as well as any noise coming in from the room. A layer of acoustic fabric and a molded-vented polymer shield help deaden and disperse sound waves, leaving you with clean and dry recordings with little to no coloration. The RF-C12 allows the microphone depth to be adjusted so you can dial in the right amount of room ambience. Easily slide the microphone closer to the filter for less pickup of room noise or slide the microphone away to add space in your audio recording. The Auray Desktop Isolation Filter is mounted on its own stand. This allows you to place your filter and mic setup on a desk or tabletop, which is ideal for recording vocals, doing live podcasts, or broadcast applications. It's a portable option for doing recordings on the go. The isolation filter's height is adjustable from 7.25 to 9.1". (18.4 to 23 cm), and can accommodate all sizes—short or tall—to optimize mic placement when capturing audio. Box Dimensions (LxWxH) 15.4 x 10.9 x 4.7"
Box Dimensions (LxWxH) 6.7 x 6.6 x 1.7"
Box Dimensions (LxWxH) 19.3 x 14.9 x 7.7"